Another quick update for you, don’t forget that we have a category for ‘young’ people, so if you know of any youngsters who have begun quilting get them to enter, we have one already from a young man, so get the thinking caps on. 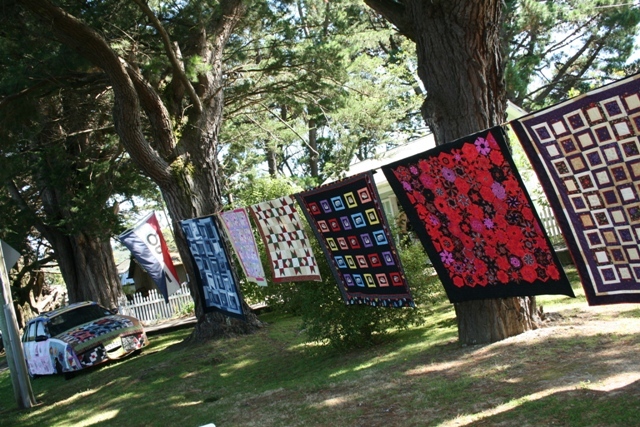 Also Sawmillers is open as usual on Waitangi Day, so if you want to drop off quilts that day we shall be here, and of course if you want to enter a quilt or quilts you can scan your registration forms and send them to us. There will be some great fabric reductions on the day too as well as some other ‘specials’ more to come on that nearer the time. Well, everything is coming together now, the bouncy castle for the junior attendees is ordered, along with fine weather, not too hot or too windy, so lets keep positive about that, bearing in mind the weather has been less than kind to us so far this year! We, have had our final meeting so all the volunteers are raring to go, don’t forget to get those registrations in, this event is just a lovely relaxed country affair, the quilts are hung to inspire existing and perhaps new piecers and quilters to create great things, and after all all the donations go straight to Te Omanga so what better charity could we select. The CR8 group of ladies ( and maybe men too!) will be having a display too, I think it is based around the 4 Elements so should be very interesting and they enjoy displaying their creative efforts to everyone. Stonestead will as usual be open, and the merry band of helpers will be there to ensure you don’t have to wait too long, as usual too Kevin will have his famous Devonshire Teas available, where else do you get such good value for money not only home made scones but all his jams are too, you will often see him beavering away late at night making jams for us to enjoy, he also has clotted cream now, so the cream teas are even more authentic. Sawmillers will also be open, Yvonne will be ably assisted by Trish and Cheryl and there will also be some quilts for sale, these will be displayed in the front of the property and shall have notices on them too. So, enough for now, I hope we have given you some encouragement to participate in this one off event, get those registrations in and let us have another fun day at Stonestead. FYI: The Official Greeters will be in attendance, sleeping I hope!